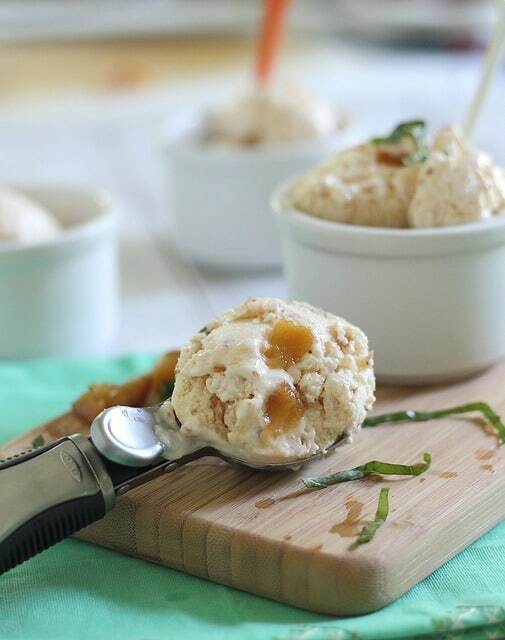 Simple homemade peach frozen yogurt you can make without an ice cream maker. Creamy and peachy but still healthy. Yesterday at the Jersey shore watching plenty of stick thin girls in bikinis walk around with surf boards on their shoulder, I reached an epiphany. If looking like that means forgoing toasted coconut ice cream cones from the boardwalk on summer weekends, it’s not worth it to me. I’d much rather happily attack a rapidly melting ice cream cone when it’s 98 degrees outside than worry about what it’s doing (or not doing) for my hip, thigh and stomach area. They make cover ups for a reason. I’m over it. 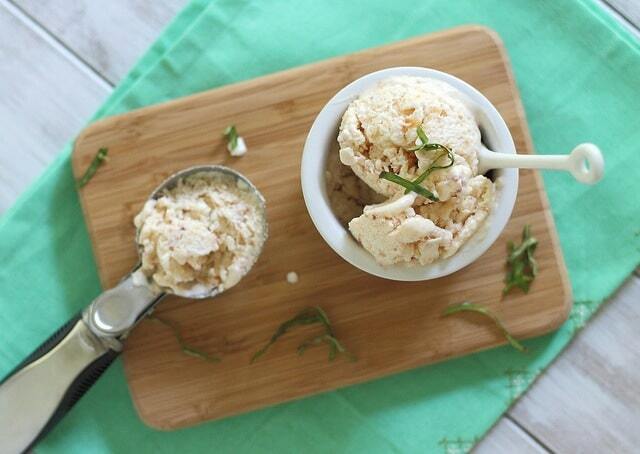 Some things are just worth it and toasted coconut ice cream sugar cones are one of them. This is not ice cream. This is homemade frozen yogurt with fresh peaches. A weekday attempt at a treat when you’re sans ice cream maker, beach and boardwalk. It’s takes almost no effort to put together, just some patience. And the best part about it? It’s packed with protein and completely guiltless. So you can enjoy it after a workout to refuel or just as an afternoon treat in between the “real” stuff on the weekends. Combine yogurt, protein powder if using and vanilla extract in a medium bowl. Remove from freezer and let sit 15-20 minutes. Transfer frozen yogurt to a food processor and add peach slices. Pulse a few times until peaches are broken but still chunky and incorporated with the yogurt mixture. Transfer back to medium bowl and refreeze for another 1-2 hours depending how hard or soft you want it. Enjoy an easy frozen treat guilt free! Great use of not having an ice cream maker! I’ve been making frozen yogurt in my machine and it comes out hard as a rock!! I love the idea of not using the machine, it’s perfect way to make a small portion for dessert! Going to do this tonight!!! I love homemade frozen yogurt, especially with fresh fruit – great, simple recipe! I like your epiphany a lot. I use Designer Whey. I’m sure Sunwarrior would work and the protein powder is totally optional so you could definitely leave it out if you didn’t want to go that route! haha yup I posted an “ice cream” recipe today too, its that time of year! 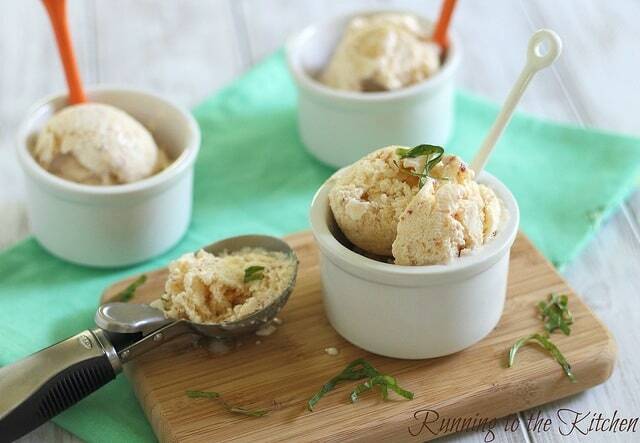 I love the chunks of peaches in there, must have things to chew on in my ice cream too. I love the HUGE peach chunks in this fro-yo Gina! I need lots of chunks in my ice cream, love all the texture! It’s good to know that I can make healthy fro-yo at home with greek yog! OOOHHH. It’s the greek yogurt piece I’ve been missing! You can use regular yogurt too. Just use a yogurt strainer or line a colander with cheesecloth to strain the yogurt until you get out as much liquid as possible. Greek yogurt is prestrained, but it will still help to strain it even more. It’s the liquid that freezes. Same reason it helps to prefreeze the peaches. If they’re juicy when you add them to the yogurt, the liquids incorporate with the yogurt mixture and cause the whole thing to freeze solid instead of just the fruit. This is less a problem with peaches than it would be with, say, berries, because of their relative densities. This looks great! I’m constantly wanting to make ice cream or frozen yogurt but don’t have an ice cream maker – this is a great solution! i love this idea! i do not have an ice cream maker either… peaches aren’t quite so great here yet so i will have to wait on this. but i do have an abundance of cherries. like a huge gallon bag and this might be what i want to do with it! thanks for the idea. no cover ups indeed! YUM! I usually skip right by ice cream recipes since i don’t have an ice cream maker so this gets me excited to do some experimenting. I see some basil in there, did you just use it for garnish? Might be good in the ice cream too! Happy Summer! It was only a garnish…I definitely want to try it in the froyo next time though I just thought about it too late this time around! Your recipe for Peach Yogurt sounds delicious and refreshing. I love how much protein is involved, too! Thanks for sharing. Great idea, especially if you do not need ice cream maker to make this! I love the little peach pieces in the frozen yogurt! Peach obsessed me needs to make this :) Thanks for sharing, Gina! 5 stars because I’ve not been smart enough to add protein powder to my recipes. Also because your food photos make me never want to post a recipe of my own again. I’ve got piña colada fro cho that I’ve been waiting to blog about. I should get cute ramekins or something. you better post that fro cho recipe, lady! Don’t mess around with pina colada! I agree – I’d rather good food than be stick thin which is why I hate diets. It’s a bad word. But love the recipe b/c peaches in anything are awesome! i agree! you have to enjoy life, but everything in moderation. 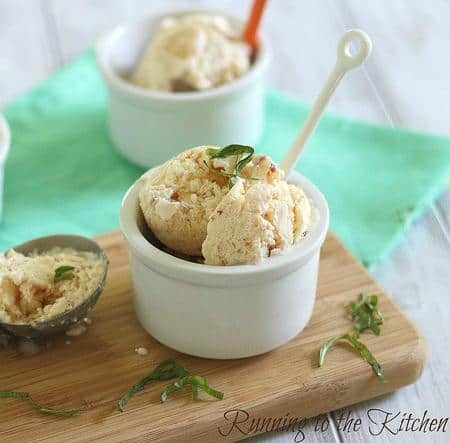 that’s why this frozen yogurt recipe is great during the week and then do the toasted coconut ice cream for the weekend splurge! I can nearly live on fresh peaches this time of year. This is making me want a sweet afternoon snack! Yum!!! I love how you don’t need an ice cream maker – I’m constantly looking for ways to make my own ice cream but I don’t want to splurge on an ice cream maker. This, along with the fact that you used Greek Yogurt just means this recipe is a dream come true! this is the epitome of awesome. it has my favorite flavor (peach) and it’s a froyo!! amazing! I love my ice cream and I’m not afraid to show it!! Okay well maybe I am – but I love to indulge and would rather cover up a little extra me than forgo it for the sake of “hawtness”. Puh-leeze, hand me a spoon – this looks positively divine Gina! haha! What beach were you at? tis the time for ice cream it seems- and this looks so do-able! great idea with the protein powder, have you ever tried Sigg’s yogurt? it’s like greek, but better, and has loads of protein, like 14 g a serving… i wonder if it would work with this. I have tried it, but only once. Love it, don’t love the price tag though! Yup. That’s my kind of ice-cream – love the addition of protein powder! Holy Yum!!!! I am so making this TODAY!!!!!!!! Yay! Finally a froyo recipe without an ice cream maker! Hmm sounds delicious! I have an ice cream maker so have made ice cream a bunch of times – strawberry, oreo, green tea, etc. but have yet to start experimenting with fro yo! This looks delicious and I love that you don’t need an ice cream maker for it because I don’t have one! I’ve never made froyo at home, but this is a must try! What a wonderful recipe! I wouldn’t want to give up the ice cream either. I’m your newest follower, and am loving your blog! Thank you so much for this lovely healthy frozen yogurt recipe. As a personal trainer I am always on the hunt for recipes I can use and also share with my clients. I made this for dessert tonight and it is absolutely easy and scrumptious!!!! Next time will experiment with different fruits but just love the peaches. Thanks again! Hi All. I have tried making frozen yogurt at home without an ice-cream maker but it always seems to get ice crystals in it. Does that happen to everyone or is it just me? The frozen yogurt that you buy at the shops is smooth and creamy. Any ideas on how to avoid the ice crystals? Thanks. thank you so much… this recipe is fab…. its simplistic, healthy, and delicious … exactly the way i like it… thanx again doll! This is so easy to make and I’ll try it, but with strawberries. Thanks for the idea!